Like clients Kirby and Jonathan, you can write and publish your memoir. Consider the Memoir class as getting your feet wet, the Creative Writers Workshop as training, and personal writer’s coaching & editing as the swim toward the finish line. Diana Nyad, 64, an American long distance swimmer, became the first person to swim from Cuba to Florida without using a shark cage in September 2013. 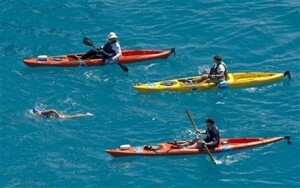 She attempted the 110-mile swim in 1978, then three more times during 2011-2012 without success. Undaunted, she kept trying. Some take to writing easily, while others need encouragement. All could become successful writers. I’ve seen those who keep dipping their toes rippling the surface ‘thinking’ about writing while others tread water. These waste mental and physical efforts. With practice and determination, others jump in to navigate their past and write their memoir. On earlier tries, Nyad was stung by jellyfish, harassed by harsh currents and battered by storms forcing her to quit. Still, her quest wasn’t over. She changed tactics, updated equipment, and kept trying. Obstacles were just lessons to examine and conquer. Many hindrances can slow writers, but our self-doubts can sink us. My greatest lesson in how to deal with doubt came from my swimming practice. Whenever excuses weigh me down, and I really, really don’t want to swim, my motto is ‘get in the water.’ This never fails: I begin with the assurance I can stop whenever I want. All the negative messages float into my mind like stinging jellyfish or attack my gut like sharks. I endure and keep swimming. Interestingly, whatever was blocking me – sinus issues, achey body, ornery mood – improves or dissipates. Each time, I accomplish my goal of swimming my usual number of laps. Jump headfirst into your writing. Enjoy the weightlessness of freedom, the unburdened feeling of writing what comes from your pool of memories. See what surfaces. Nyad, like any seasoned athlete, dove to mental and emotional depths to acquire physical strength to complete her goal. She didn’t swim alone; she had community onshore, as well as a boat load of folks for moral support and to watch her back. In teaching memoir for years, I’ve seen group after group coalesce and support one another to dive deep into consciousness and bring up treasures. Join the Memoir class, a guided group of no more than six participants. The expedition is more fun, even more enlightening, with others. Compassionate, honest fellow writers are crucial to your success; they want you to win! This happens with every Creative Writers Workshop I’ve led, a group of no more than 4 writers. As your writing coach, I mentor you to chart your writing’s course and hold you accountable as you move from writing and revising to editing and publishing. With friends and a dedicated coach on your team, you can more easily write and complete your memoir. References: Associated Press; Mike Smollins.